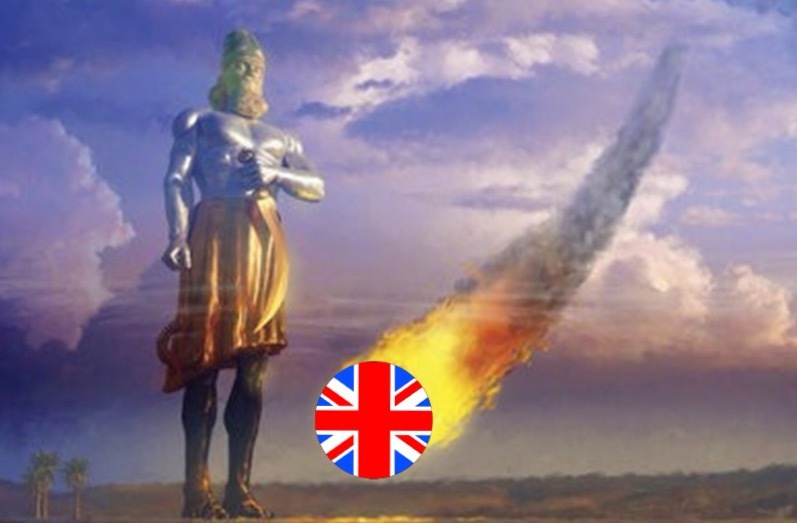 LONDON, United Kingdom --- Already well-known for its Rolling Stones, the United Kingdom aimed a devastatingly effective projectile straight at the fragile feet of Nebuchadnezzar's statue yesterday, signaling the beginning of the end for a lot more than the already shaky European Union. Britons unhappy with the bureaucratic mess of red tape that is Brussels (the seat of the EU) voted decisively to leave the EU yesterday in the much-discussed Brexit, sending stock markets crashing, the British pound plummeting and right-wing politicians across Europe clamoring for similar exits by their own countries. "What we are witnessing is every bit the nightmare that Nebuchadnezzar experienced and we are about to see devastation not even doomsday prophets could have dreamed up," said Adventist Current Events Expert Doug Batchelor. "Cold-hearted or not, it doesn't take a genius to see that very soon the Brits won't be alone in rejecting iron and clay as building materials." If you are seriously quoting Doug Batchelor I am going to roll my eyes and shake my head! It sounds like something he would actually say. Amen!! B.A. Refrain from laying the warped theories of the Sacramento Caveman on to your devoted readers! “. . . rejecting iron and clay as building materials.” LOL! Hooray for the Prophet, Daniel. He was right all along. Bless his heart!! The END is not near, but HERE!! Woe iz me & you! Time to go down into my underground anti-nuclear-bomb bunker! Hey, Millie–Hope you have a method of defending yourself from all the crazies!! They will find a way to enter your safe abode. Then you will have to share all the Little Debbies stashed in the back corner. Barely adventist is a satire site. I wish people comentong would enjoy the laugh at ourselves and please do not take yourself too seriously! Darrin, you are mistaken. This site is as serious as a heart attack. Poor misguided souls like you are a sad case. Wake up and smell the coffee (or should I say, the Postum? ).